Hatfield Secondary Technical School opened in 1953 and was originally sited in College Lane. It started with 120 boys and girls, a number that rose to about 900. It offered German rather than Latin and, according to the BBC’s “Domesday Reloaded” website, the girls at the school did needlework and cooking, while the boys did woodwork and metalwork. 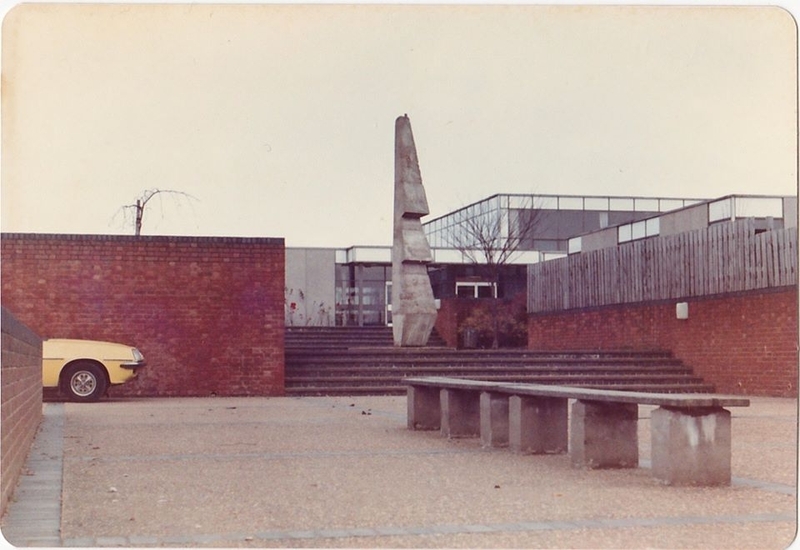 In 1971, the school moved to the southern end of Travellers Lane between Hatfield and Welham Green. The school’s status changed to become a mixed-ability school. Michael Slaney was the Head Teacher. The school closed in 1990, after which the county council re-used the site (called New Barnfield) for its Central Resources Library and other educational services. In 2011, the site became the subject of significant controversy when the county council announced its plans for a giant incinerator there, a decision that was later overturned at Government level and in the courts. This page was added on 05/11/2015. I was a pupil at Hatfield School from 1959 to 1964 under Dr Hutton as Head. I am now retired and live in the North of England and would really like to get in touch with anyone who was there at the same time. How lovely reading about these people I remember so well. I am Liz Slaney ( now Walker). Lots of people have been asking about my dad. He did move to Wales and was one of the organists at st David’s cathedral. Him and my mum had a great life there but unfortunately my dad’s eyesight is really poor and he had to give up driving so they moved to the south coast two years ago to be near me and my brother. He is 89 this year and is still as fit as a fiddle. He is planning on walking the South Downs Way in the year leading up to 90!!! Would love to hear from anyone who remembers me. Will also pass on these lovely comments to him. I went to Hatfield Secondary from 1972-1975 with Elizabeth Slaney and others Andrew Webster, Paul Legget, Helen Lewis, Julie Lewis, Tracy Roberts and many others whose names I forget. I have lived in South Africa for the past 43 years and often think about my town and the school. As for MR. Slaney he was always nice to me for what reason I have no idea, I was not the best student. If any one from that time reads this write a note, maybe you remember some of these people and may been even myself . I was at Hatfield School from 1974 until 1977. Most of the times were OK. I graduated at the Hatfield Poly on College Lane, Roehyde in 1982 with an HND in Electrical and Electronic Engineering. Judy Gwilliam *who moved to Nassau Bohamas in 1977. Daphne Skinner Chemistry she was an excellent teacher. Judy Gwilliam was our form tutor except for the last year when Peter Smeeton took over. I have no idea what happened to Michael Slaney post 1990. I do know he had a daughter who attended the school at the same time. I think her name was Liz. I was there 64 – 69. I was in Darwin and I remember Mrs Bantick was our form teacher for a while. Dr. Hutton was head when I started, Mr. Slaney when I left. Miss Greene? for English. Mr. Huntingdon for Physics? Had a schoolboy crush for Karen Asplin in my class – haven’t seen or heard anything of her since then. It was a good school I had a great time there. The only sad bit was the commute from Harpenden each day. I went to Hatfield school 1974 to 1979 formally Owen. I remember Mr Slaney; he was a great musician. I hated the walk to and from school as we lived on The Ryde. Attended Hatfield School 1966-1971with my twin, Geoff. I joined the County Council in Hertford at 16 and Geoff went on to University. He has been teaching for nearly forty years. I retired from HCC after 40 years. We are involved with twin research at Saint Thomas’ s unit in London – the biggest twin research unit in the world. We are still very close and meet up regularly. Brother Dave and sisters ( Linda and Sandra) also attended the school. Very fond memories. We were involved in school drama and have Peter Green ( geography teacher) to thank for that. Also really liked our German teacher – Dr Frankel, and many others. From an internet search two years ago I think, I learned that Michael Slaney was a regular organist in the churches of Wales. He was a good musician and had to decide between maths and music when he went to university. I was at the school between 1965 and 1972. Our House, Darwin was overseen by John Bantick and then Mr. Eustace took over in the second year. Our various teachers were, Mrs Townsend, Physics, Mr. Hughes Chemistry; Mr Pidcock (deputy HM and Tuck Shop runner) Mr. Morse who really taught me Maths, Dr. Frankl for German, previously by Terry Hickson and Madoc for German Supply. We had a blonde bombshell for PE… confused hormonal adolescent boys. Bryn Jones for Woodwork. Smeeton for TD. Our reunion group gets together every February and although I hated school and its bullying classmates with a passion I am a little tempted to return and meet up with some of the good guys…. Facebook message me on the above name or text me on 07889 693681 – I am sure there are other Alumni who can pinpoint people we are looking for as well as we providing info on others…. In particular if anyone has an idea as to where the following are… Phil Ballard, Barry Dodge, Mark Capsey, Barry Crick and Stephen Farr as well as Cghristine Callen, Sue Dartnell and Janet Boulter it would be a great help. I was a pupil at Hatfield School between 1961 and 66. For the final 3 years, my class and Maths teacher was Mrs Bantick whom I remember with affection and a great deal of respect. Although I left with minimal qualifications, I could not quite keep away as I later returned to the site itself to study and later still, teach, at the University of Hertfordshire. I went to this school ’71 to ’76. Left Xmas ’76 to move to Cumbria. Had Glenn Christian as our form tutor. 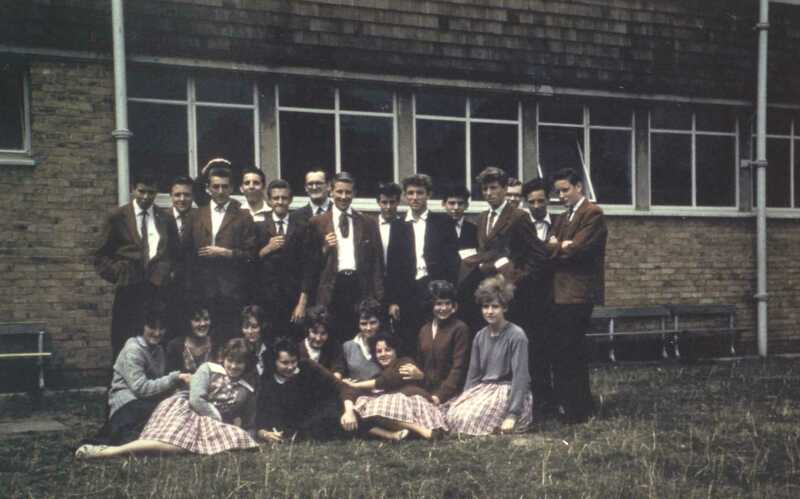 I was at Hatfield Tech, Grammar School from 1956 -1959. I remember Mr. Spence (art), Mr. Gregory (German), Miss Fitall (maths), Mr Alison & I remembered Raymond Dunne (2 yrs ahead of me). Great school. I went to the Hatfield School from 1980-1984 before returning back to my home country Canada to finish Grade 11 &12. I remember having Mr. Nash in 1980, quite a strict teacher. Mr. Gwilliam was our shop teacher; I believe he was fresh out of University. I recall one student did a camp-out at the top of the chimney tower to raise money; anyone remember this? Mr. Daniels was my Geography teacher and I believe he married the History teacher at Hatfield school. I returned in 1992 with my wife and drove back to the school, was very sad to see it was closed, I walked into the old racquet ball court and there were still some old team photos hanging on the wall from the 70’s, the swimming pool was drained and in disrepair. It was quite depressing after having so many good memories of playing tag with the other kids and climbing the wall at the front entrance. I took my kids there on a return trip in 2007, still brought back good memories even then. Wow just found this page whilst surfing the net. My name is Paul Gosbee. Was at Hatfield School from 1966 to 1973 so went to school at both sites. Was in Darwin house. Seen a few names on this blog I recognise. Currently I am in South Africa involved with mission activities for 3 years after retiring 5 years ago from teaching. Anyone know happened to the head Michael Slaney? I will never forget walking home across the playing fields after school with John Mayne and another guy. We were all about 13 years old or thereabouts. Across the distance came three guys from St Audrey’s and they threatened us, I remember John Mayne walking up to one of them and ripping his shirt from neck to waist and then just calmly stepping back . For the St Audrey’s boys it was a salutary lesson in not messing with Hatfield School kids. I recall we never had problems with St Audrey’s after that. Happy days and well done John. Wherever you might be. That was impressive. Michael Browne (below) is correct, it was not a grammar school it was officially named Hatfield Secondary Technical School [thanks for the clarification – I have removed the word “Grammar” from the above article – Ed. ], but it was quite unique. I will try to write a piece from an Arts point of view, to complement David Clarke’s piece on computers, but later perhaps. I have yet to come across a school in the public sector offering such a breadth of education at that time, or such equality. The girls did woodwork and metalwork (Mr Smeeton let us make copper jewellery which was in vogue then in 1964) and the boys did cookery and needlework for at least a term, although some boys took cookery to A level and my sister and her friend took O level woodwork. There were some teachers who didn’t really want girls to do chemistry, but that was their own private prejudice, not school policy! Everyone had to learn German, as that was the most useful language for science, and if you were good at German, you were encouraged to learn Russian, also important for scientific research. I learnt 4 foreign languages at that school, one an extra O level in the sixth form. We had theatre trips, saw new films at The Odeon Leicester Square, had visiting poets and musicians who turned out later to be really famous, in particular the guitarist John Williams, and the poet Sheamus Heanney. Films were made by staff and pupils (before my time), but we had amazing drama productions, perhaps due to the fact that David Cregan (the playwright, later of Orange Tree Theatre fame) was one of our English teachers. The drama lessons with him were inspirational! And although he didn’t teach me, Philip Madoc, the actor, taught German conversation for a while (and as a fluent German speaker I can tell you his German was flawless! ), I’ll just never forget suddenly seeing him for the first time there, wondering what the “baddy” from the Dr Who and the Daleks film I’d just seen, was doing in my school canteen!!! They made a grave error when they first cut it’s funding when it moved (they were never given an equivalent of the sixth form common room again, even though it had been built by parents and pupils), and then closed it down in 1991. Such a history. It made people like David Clarke and me, and I will be eternally grateful to all its staff. I’m proud to have been a pupil there! I went to Hatfield School in 1971 – 1976. Being the first year of a new school I remember the first day in the hall when ALL the pupils were gathered and we were given a map showing the layout of the rooms. The lecturer commented that as first year pupils we wouldn’t get sent to the wrong rooms by senior students as THEY didn’t know where they were either. I used to play (with varying degrees of success) in the school orchestra. Does anyone have a copy of the recordings that were made? Also does anyone have the e-mail address for Mr Rook our music teacher? I still owe him five pounds and would like to pay it back. (with interest of course). My name is Chris Swingler and I attended Hatfield school from 1960 to 1967. I also had two brothers at the school called Nick and Gordon /Richard (titch). I think John Churchill was a prefect at the time and let me borrow a copy of what was then an illegal copy of Lady Chatterley’s Lover. Unfortunately I was caught with it by I think Mr Sircombe and arraigned before the head who asked me what I thought of it. I had only got to page 40 and so far very boring! Chris Young took me to Wales on field courses and subsequently I hitch-hiked there one day, became a teacher and did not return for 35 years. A brilliant school that gave me skills that have never left me. Hi, my mother in law is looking for an old Hatfield School friend called Elizabeth/Liz Western, around the mid-sixties as Barbara is 67. She was Barbara Wojcik and is now known as Barbara Shead. Also a friend Paul Fitzpatrick. I wonder if anyone can help. My name is Frances Shead and I would be grateful if anyone could help. Many thanks. I well remember the sailing on the Norfolk Broads. We took a really well built dinghy with us and I was a small part of the building of said vessel. It was constructed from marine ply wood and initially built in a corridor recess near the woodworking room. Our teacher ( I forget his name ) was also building a guitar for himself. Very smart bloke. He also owned on old three wheeler called a Bond I think. Above someone mentioned Mrs Fitzpatrick. She was my geography teacher and we used a reference book written by a relative of mine with my surname. A distant cousin or aunt. On reflection the time I spent there ( 5 years ) was OK. School was never my thing however and I left advanced education to very late in life, in Australia. I lived in Harpenden and was in the 3rd Harpenden Scouts. That’s it, now you all know too much already. I was a pupil in the same class as Michael Trewhella from 1967 until 1974 at both the College Lane and the Travellers Lane sites. I have kept in touch with friends from our class all this time and we meet up with our husbands twice a year and have fun times together. Us girls all turned 60 last year and we had a celebration weekend with our men. Who remembers us? Hazel Mead (me), Lesley Taylor, Jenny Taylor, Sue Wallis and Sue Lewis? We talk about school days often which they enjoy but for me I’d rather forget them! 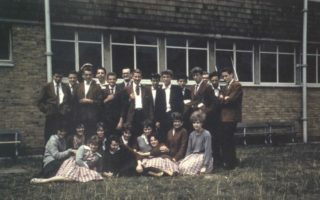 I was at Hatfield School from I think the third intake ( 1956 ? ) through to when I left at age 16. Dr Hutton was the very strict Head Master and the feeling of youthful relief was amazing as I finally walked away from secondary schooling for ever. I went twice camping and sailing on Barton Broad. My second visit I could take GP14 out by myself. I remember having to capsize and right a sailing boat as part of instruction. Course was run by Herts County Council. An excellent instructor. I recall Mr. Morse. I also went by train on a School trip to Germany and Austria, staying in Youth Hostels in Berchesgarten and Zell am Zee. Got some colour photos somewhere. I did go back to old classroom, some years later whilst on a course at Hatfield Polytechnic. Was there from autumn 55 and of course remember la belle Lorna. Have since lost stuff moving around abroad but have in front of me now a Postcard with aerial view of Hatfield School, dated March 1954. Plus several b&w pics of work underway when we pupils built the 6th form common room, up in the top RH corner of the hollow square against, I believe, the library. At 16 I was happily operating a Kango hammer, no damn Elf and Safety then! AND formal permission to dig up the school!! Pics show Richard Dunne, Ron Smith, me, ANO. A great school, with a brilliant Head in Hutton. You had to like him even when he was ripping us off after we blew the side off the gardener’s shed in a very unofficial chemistry experiment. He sent 3 of his kids to the school, Michael was also in our class and his sister Mary Hutton immediately of course became Hairy Mutton. Teachers: Brooker, later Nash – Games/Sports: Ashcroft?, later David Cregan who was a published author – English: Tagg – a fine Maths teacher: Prideaux, all Languages but much older than Fitzpatrick and clearly resented only being Senior Master and not Deputy Head. Unpopular. : Donnelly – Engineering Drawing. A great time, when we were establishing the traditions not just following them. I am interested in hearing from Raymond Dunne – I was part of the 3rd intake in 1955 – and does anyone have the words or tune for “Youth is the time for plans…” our school song? Please get in contact with me on 01736368408 or miketrewhella@Aol.com, regards reunions at Hatfield school as I was pupil there from 1967 onwards. Hello folks, I am at the moment, administrator for Hatfield Reunion group from 1953. Our last reunion was 2014 and another has been planned for this year. There are more than sixty of the original pupils (120) who were first to attend the school. I am interested in contacts from others who attended in other years and who may be interested in joining our reunions. When the school opened in 1953 the ‘lane’ was still part of Roe Green Lane, and the ‘Technical College’ had opened the year before (1952). The school then was originally called ‘Hatfield Technical School’ although the ‘Technical’ was dropped. We all had to wear uniforms and if you were reported to have been seen in public not wearing the uniform properly (no cap or tie etc.) you would be punished. 1961 – 1967 Mrs Fitzpatrick was deputy head under both Dr Hutton and Mr Slaney – certainly until I left. The original sailing club had a single GP 14 when it started and was re-decked in the Gym sometime around 1968. Can’t remember the guy’s real name who did most of the work but nicknamed ‘Turf’. Towed it over to Rickmansworth sailing club behind the school’s Bedford mini bus and brought it back a couple of times. Took it down to Thorpe Bay Yacht club (Southend) with Martin Davies. Barton Broad and or Aldeburgh were the two annual summer trips – under canvas!! Radio Club existed in a shed out the back of the school near the woodwork room. Run by the metalwork teachers Mr Smeeton and ?. Useful place to hide away from lessons at times. Still have contact with Barry James and have had with Michael Wakefield. I went to Hatfield School from 1968-73 so was at both College Lane and Travellers Lane. I was in Faraday with Julia Lewis and Elaine Holzel. I remember our Maths teacher, Mr Flowers, as Julia had a crush on him! I went from 1983 to 1988. Mr Slaney was the head and Mr McDowell was the deputy. My form tutor was Mr Balbinski (don’t know if I’ve spelt this correctly). Mr Mills for history; he had really small writing. Mr Rose for Sciences. 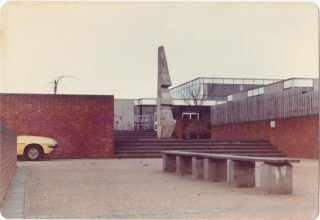 We used to leave our school bags around the monument at the front of the school just by the swimming pool. I am puzzled as you are describing this school where the now Hertfordshire University is in College Lane as a Grammar School. It opened just as I was leaving St. Audrey’s in 1952. Surely this was initially set up school which was to concentrate on technical subjects, and was the local technical college with evening classes etc by 1960. After I left Hatfield in 1959 they started a 3 year course for the first part of Civil Engineering qualification which if I’d stayed at home would have jumped at taking instead of having to start it as I did by correspondence course. Personally I never did finish it, and learnt by experience and site practice and think I had a far more practical application to problems than many of the so called qualified engineers that I met up with during my working life. I have to thank my original department colleagues Arthur Dodding and Roy Nash in the 1952-1960s engineers section of the Hatfield R,D.C. for their part in my training. Can you recall who was deputy head when Michael Slaney was head? I went to the original school in College Lane 1962 – 1969. I left before the move to Travellers Lane. However, I remember that some of the staff you mentioned were at the College Lane site while I was there. Mr Slaney, of course. He replaced Dr. Hutton when he retired before the move. Reason 1: He used run the sailing club, and all the members used to hike off up to Grafham Water, to run the school’s boats. I particularly remember the Tempo Scow, a beast of a boat, that went like a rocket on rails. There were Wayfarers and GP14’s too, but these weren’t as exciting. Reason 2: He had 2 particularly beautiful and blonde daughters who also loved sailing. They were called Carolyn and Susan (nicknamed Boo). An impressionable and red-blooded young man couldn’t fail to remember them. I also remember Mr Mills, the history teacher, but more so Mrs Mills who taught English I think. She was a tiny, skinny woman whereas Mr Mills was quite tall and well built as I recall. However what she lacked in stature, she more than made up for with formidable and indomitable presence. She scared the living daylights out of me, and Yes, I did pass my O Level English. Although I don’t have any photos of the Old School as it was in 1969, I took some recent photos for my computer science article. 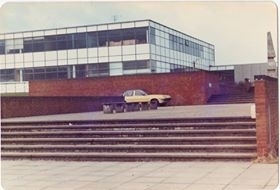 The school, now part of the University of Hertfordshire, is unchanged from the 60’s. Heady days of fun and learning, and detentions which always made me miss the coach back to Ware. I remember Mr Slaney along with a few others Mr Morse (Maths) Miss Hetherington (Geography) Mr Shepherd (Music & RE), Mr Mills (History) Mr Peachey (PE and Metalwork). Fond memories but precious few photographs of the school in Travellers Lane I am in touch with many old school mates via Friends Reunited but no one seems to have any photos of the old school.